For other uses, see Absolute value (disambiguation). The absolute value of a number may be thought of as its distance from zero. In mathematics, the absolute value or modulus |x| of a real number x is the non-negative value of x without regard to its sign. Namely, |x| = x for a positive x, |x| = −x for a negative x (in which case −x is positive), and |0| = 0. For example, the absolute value of 3 is 3, and the absolute value of −3 is also 3. The absolute value of a number may be thought of as its distance from zero. Generalisations of the absolute value for real numbers occur in a wide variety of mathematical settings. For example, an absolute value is also defined for the complex numbers, the quaternions, ordered rings, fields and vector spaces. The absolute value is closely related to the notions of magnitude, distance, and norm in various mathematical and physical contexts. In 1806, Jean-Robert Argand introduced the term module, meaning unit of measure in French, specifically for the complex absolute value, and it was borrowed into English in 1866 as the Latin equivalent modulus. The term absolute value has been used in this sense from at least 1806 in French and 1857 in English. The notation |x|, with a vertical bar on each side, was introduced by Karl Weierstrass in 1841. Other names for absolute value include numerical value and magnitude. In programming languages and computational software packages, the absolute value of x is generally represented by abs(x), or a similar expression. , respectively) are a more common and less ambiguous notation. The absolute value of x is thus always either positive or zero, but never negative: when x itself is negative (x < 0), then its absolute value is necessarily positive (|x| = −x > 0). From an analytic geometry point of view, the absolute value of a real number is that number's distance from zero along the real number line, and more generally the absolute value of the difference of two real numbers is the distance between them. Indeed, the notion of an abstract distance function in mathematics can be seen to be a generalisation of the absolute value of the difference (see "Distance" below). is equivalent to the definition above, and may be used as an alternative definition of the absolute value of real numbers. Some additional useful properties are given below. These are either immediate consequences of the definition or implied by the four fundamental properties above. The absolute value, as "distance from zero", is used to define the absolute difference between arbitrary real numbers, the standard metric on the real numbers. have the same absolute value. where Re(z) = x and Im(z) = y denote the real and imaginary parts of z, respectively. When the imaginary part y is zero, this coincides with the definition of the absolute value of the real number x. The complex absolute value shares the four fundamental properties given above for the real absolute value. In the language of group theory, the multiplicative property may be rephrased as follows: the absolute value is a group homomorphism from the multiplicative group of the complex numbers onto the group under multiplication of positive real numbers. The real absolute value function is continuous everywhere. It is differentiable everywhere except for x = 0. It is monotonically decreasing on the interval (−∞,0] and monotonically increasing on the interval [0,+∞). Since a real number and its opposite have the same absolute value, it is an even function, and is hence not invertible. The real absolute value function is a piecewise linear, convex function. Both the real and complex functions are idempotent. The subdifferential of |x| at x = 0 is the interval [−1,1]. The complex absolute value function is continuous everywhere but complex differentiable nowhere because it violates the Cauchy–Riemann equations. The second derivative of |x| with respect to x is zero everywhere except zero, where it does not exist. As a generalised function, the second derivative may be taken as two times the Dirac delta function. where C is an arbitrary constant of integration. This is not a complex antiderivative because complex antiderivatives can only exist for complex-differentiable (holomorphic) functions, which the complex absolute value function is not. The absolute value is closely related to the idea of distance. As noted above, the absolute value of a real or complex number is the distance from that number to the origin, along the real number line, for real numbers, or in the complex plane, for complex numbers, and more generally, the absolute value of the difference of two real or complex numbers is the distance between them. The above shows that the "absolute value"-distance, for real and complex numbers, agrees with the standard Euclidean distance, which they inherit as a result of considering them as one and two-dimensional Euclidean spaces, respectively. 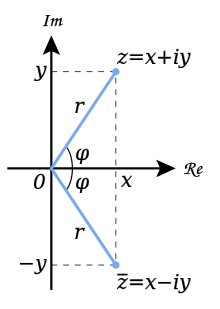 where −a is the additive inverse of a, 0 is the additive identity element, and < and ≥ have the usual meaning with respect to the ordering in the ring. The four fundamental properties of the absolute value for real numbers can be used to generalise the notion of absolute value to an arbitrary field, as follows. Where 0 denotes the additive identity element of F. It follows from positive-definiteness and multiplicativity that v(1) = 1, where 1 denotes the multiplicative identity element of F. The real and complex absolute values defined above are examples of absolute values for an arbitrary field. for all x, y, z in F.
An absolute value which satisfies any (hence all) of the above conditions is said to be non-Archimedean, otherwise it is said to be Archimedean. Again the fundamental properties of the absolute value for real numbers can be used, with a slight modification, to generalise the notion to an arbitrary vector space. The norm of a vector is also called its length or magnitude. is a norm called the Euclidean norm. When the real numbers R are considered as the one-dimensional vector space R1, the absolute value is a norm, and is the p-norm (see Lp space) for any p. In fact the absolute value is the "only" norm on R1, in the sense that, for every norm ‖·‖ on R1, ‖x‖ = ‖1‖ ⋅ |x|. The complex absolute value is a special case of the norm in an inner product space. It is identical to the Euclidean norm, if the complex plane is identified with the Euclidean plane R2. Every composition algebra A has an involution x → x* called its conjugation. The product in A of an element x and its conjugate x* is written N(x) = x x* and called the norm of x. The real numbers ℝ, complex numbers ℂ, and quaternions ℍ are all composition algebras with norms given by definite quadratic forms. The absolute value in these division algebras is given by the square root of the composition algebra norm. In general the norm of a composition algebra may be a quadratic form that is not definite and has null vectors. However, as in the case of division algebras, when an element x has a non-zero norm, then x has a multiplicative inverse given by x*/N(x). ^ James Mill Peirce, A Text-book of Analytic Geometry at Google Books. The oldest citation in the 2nd edition of the Oxford English Dictionary is from 1907. The term absolute value is also used in contrast to relative value. ^ Spivak, Michael (1965). Calculus on Manifolds. Boulder, CO: Westview. p. 1. ISBN 0805390219. ^ Munkres, James (1991). Analysis on Manifolds. Boulder, CO: Westview. p. 4. ISBN 0201510359. ^ González, Mario O. (1992). Classical Complex Analysis. CRC Press. p. 19. ISBN 9780824784157. ^ Lorenz, Falko (2008), Algebra. Vol. II. Fields with structure, algebras and advanced topics, Universitext, New York: Springer, p. 39, doi:10.1007/978-0-387-72488-1, ISBN 978-0-387-72487-4, MR 2371763 . ^ Rudin, Walter (1976). Principles of Mathematical Analysis. New York: McGraw-Hill. p. 325. ISBN 0-07-054235-X. ^ a b Weisstein, Eric W. Absolute Value. From MathWorld – A Wolfram Web Resource. ^ These axioms are not minimal; for instance, non-negativity can be derived from the other three: 0 = d(a, a) ≤ d(a, b) + d(b, a) = 2d(a, b). ^ Mac Lane, p. 264. Bartle; Sherbert; Introduction to real analysis (4th ed. ), John Wiley & Sons, 2011 ISBN 978-0-471-43331-6. Nahin, Paul J.; An Imaginary Tale; Princeton University Press; (hardcover, 1998). ISBN 0-691-02795-1. Mac Lane, Saunders, Garrett Birkhoff, Algebra, American Mathematical Soc., 1999. ISBN 978-0-8218-1646-2. Mendelson, Elliott, Schaum's Outline of Beginning Calculus, McGraw-Hill Professional, 2008. ISBN 978-0-07-148754-2. O'Connor, J.J. and Robertson, E.F.; "Jean Robert Argand". Schechter, Eric; Handbook of Analysis and Its Foundations, pp. 259–263, "Absolute Values", Academic Press (1997) ISBN 0-12-622760-8. Weisstein, Eric W. "Absolute Value". MathWorld.